1. Introduction. (H. Ohtaki). 2. Structure of Solutions by Diffraction, EXAFS, and XANES Methods. Apparatus Used for X-Ray and Neutron Diffraction and for EXAFS and XANES Measurements (H. Wakita, K. Taniguchi). Structure of Liquids and Solutions by X-Ray and Neutron Diffraction (T. Radnai et al.). Structure of Solvated Ions and Metal Complexes in Solution Studied by the Diffraction Method (H. Ohtaki et al.). Structure of Metal Complexes in Solution by the EXAFS and XANES Methods (S. Ikeda et al.). 3. Molecular Dynamics Simulations of Liquids and Solutions. Computer Experiments (K. Nakanishi). Local Composition in Lennard-Jones Mixtures (K. Nakanishi, Y. Adachi). Computer Simulations of Fluid Water and Its Liquid-Gas Interface with Carravetta-Clementi Potential (Y. Kataoka, M. Matsumoto). Hydration in Dilute Aqueous Solution of Nonelectrolytes (K. Nakanishi, K. Kinugawa). The Structure of Hydrated Ions in Aqueous Solutions as Studied by the Molecular Dynamics Simulations (H. Ohtaki, K. Heinzinger). Molecular Dynamics Studies on Electric Conductivity of Ionic Melts (I. Okada, S. Okazaki). 4. Dynamic Properties of Liquids and Solutions. Dynamic Properties of Ions in Solutions (H. Nomura, S. Koda). Dynamics of Ions and Solvent Molecules in Solution - Nuclear Magnetic Relaxation Studies (Y. Masuda, H. Yamatera). Association of Alkylammonium Salts in Nonaqueous Solvents (N. Nakamura et al.). Water and Metal Ions at Water-Amphiphile Interfaces (M. Iida, A.S. Tracey). 5. Effects of Pressure and Temperature. Pressure and Temperature Effects on Irreversible Processes in Solution (M. Nakahara). Some New Apparatus (Y. Yoshimura et al.). Molecular Conformation in Solution (Y. Taniguchi, K. Suzuki). 6. Ion-Ion and Ion-Solvent Interactions and Complex Formation in Solution. Solvent Properties and Reactions in Solution (M. Tanaka). Solute-Solvent Interactions of Metal Chelate Electrolytes (Y. Yamamoto et al.). Reaction and Activation Volumes for Some Reactions Involving Metal Complexes in Solution (S. Funahashi, M. Tanaka). Ion-Triplets as the Precursor for Electron Transfer Reactions of Coordination Compounds (K. Saito). Mechanism of Sulfur-Inversion in Platinum(II)-Thioether Complexes Revisited (M. Oki). 7. Energetic Aspects on Solute-Solvent Interactions. Thermodynamic Aspects of Complex Formation Reactions in Nonaqueous Solutions (S. Ishiguro, H. Ohtaki). 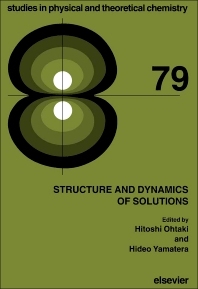 Statistical Mechanical Approaches to the Structure and Thermodynamic Properties of Solutions (H. Nomura, M. Ohba). Electronic States of Ions and Molecules in Solution Studied by Photoelectron Emission Spectroscopy (I. Watanabe). Concluding Remarks. Subject Index. Recent advances in the study of structural and dynamic properties of solutions have provided a molecular picture of solute-solvent interactions. Although the study of thermodynamic as well as electronic properties of solutions have played a role in the development of research on the rate and mechanism of chemical reactions, such macroscopic and microscopic properties are insufficient for a deeper understanding of fast chemical and biological reactions. In order to fill the gap between the two extremes, it is necessary to know how molecules are arranged in solution and how they change their positions in both the short and long range. This book has been designed to meet these criteria. It is possible to develop a sound microscopic picture for reaction dynamics in solution without molecular-level knowledge of how reacting ionic or neutral species are solvated and how rapidly the molecular environment is changing with time. A variety of actual examples is given as to how and when modern molecular approaches can be used to solve specific solution problems. The following tools are discussed: x-ray and neutron diffraction, EXAFS, and XANES, molecular dynamics and Monte Carlo computer simulations, Raman, infrared, NMR, fluorescence, and photoelectron emission spectroscopic methods, conductance and viscosity measurements, high pressure techniques, and statistical mechanics methods. Static and dynamic properties of ionic solvation, molecular solvation, ion-pair formation, ligand exchange reactions, and typical organic solvents are useful for bridging the gap between classical thermodynamic studies and modern single-molecule studies in the gas phase. The book will be of interest to solution, physical, inorganic, analytical and structural chemists as well as to chemical kineticists.